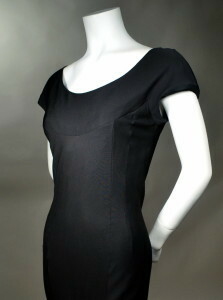 Little black 50's vintage sheath dress. Lovely black silk jersey with great drape! Gracefully sculpted neckline yoke which extends to little cap sleeves. Yoke back forms deep V. Fitted thru waist with extended princess type darts front and back. Center back 20" zipper. Pencil skirt. Fully lined with black China silk. It's a classic little black dress! Dress length, measured from shoulder to hem edge - 45"